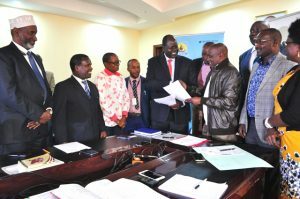 The Lamu Port South Sudan Ethiopia Transport (LAPSSET) Corridor Development Authority (LCDA) represented by the Director General/CEO, Silvester Kasuku and the National Land commission of Kenya (NLC) represented by the commission’s Chairman, Prof Muhammad Swazuri on 12th January, 2018, signed a Memorandum of understanding that provides a working framework for collaboration between the NLC and LCDA for acquisition of land for the development of the LAPSSET Corridor Infrastructure Projects, to ensure just compensation of the Project Affected Persons (PAPs) and prompt access of relevant sites by LCDA or Project Implementation agencies. NLC is mandated to manage public land on behalf of the National and County governments, the commission also has a mandate on compulsory acquisition of Land under the part viii of the Land Act, 2012 and to ensure just compensation paid promptly in full to all persons whose interests in the land have been determined. 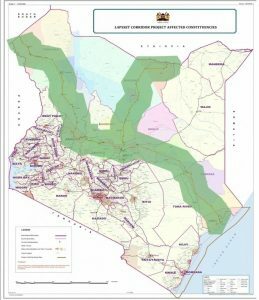 LCDA is the body mandated with the policy, implementation, operational coordination and is the technical oversight organ for the LAPSSET Corridor Project; and is also tasked with establishing an integrated implementation plan and oversee the implementation of the LAPSSET Corridor Projects according to the Presidential Order Kenya Gazette Supplement No. 51, Legal Notice No. 58. Isiolo to Moyale (Ethiopian border) and from Isiolo to Nakodok (South Sudan border) as per the diagram on the left. Product Oil Pipeline from Lamu – Isiolo- to Moyale (Kenya) and Moyale to Addis Ababa (Ethiopia). Apart from the trunk infrastructure, the LAPSSET Corridor is designed to encompass other economic activities investment infrastructure such as International Airports, Resort cities, Special Economic Zones, Industrial parks, and mineral exploration to generate and harness the economic and business activities for the corridor to bolster the viability and sustainability of the investment. Already LCDA has acquired the title deed for the 28,500 HA, Lamu Port and Ancillary facility area. LCDA Director General/CEO. Silvester Kasuku (left) and NLC Chairman, Prof Muhammad Swazuri (right) shake hands after signing of the MoU. Onlooking are the NLC Commissioners. Signed an agreement with Lamu Port Consortium for the construction of Lamu-Garissa-Isiolo road whose early works are set to commence within the 1st quarter of 2018. Signed a Joint Development Agreement with upstream partners (Tullow Oil, Africa oil and Maersk Oil) for a fast-tracked development of the Lockichar-Lamu Crude Oil Pipeline, a project whose investment decision date has been set for December 2018 , when land acquisition, Stakeholder engagement and Environmental studies are expected to be completed. Signed a grant agreement of US $ 1,936,560 with the African Development Bank, to bring on board A Transaction Advisory for private sector partnerships in the development of Lamu Special Economic Zone.